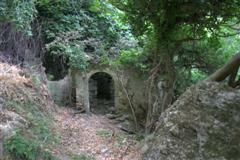 Just a few kilometers south of Rethymnon is the old village of Myli (Mylio). 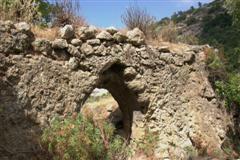 The village, in a beautiful natural area, lies in the Myli gorge. Because of the stream, found in the bottom of the gorge, the entire gorge is filled with green trees and flowers. The stream was used by the old inhabitants to power the mills in the gorge. The many remains of these mills can be found hidden among the thick green. The mills provided the grain for Rethymnon and the area around. Before crossing the stream you will see the house of the tax collector, who taxed all the millers in the gorge. The building is from the Venetian period. 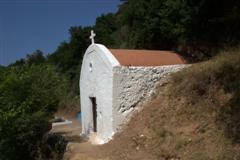 Some churches can be found next to the stream. The small chapel of St John is the first chapel you pass walking into the gorge, build inside the rock face next to the path down. 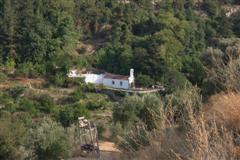 After passing the stream you will get to old Mylio, where one of the old inhabitants opened a small bar. He serves small foods and refreshments, all foods and meats are local products. Sometimes the paths are very wet, good shoes are recomended. Its possible to exit the gorge at the other side, a taxi can bring you back to the start.